GO ON, INDULGE YOUR CURIOSITY AND LEARN ABOUT ME! Off to another Friday flick at Innis, I’m happy to hide indoors to watch Wim Wenders’ Wings of Desire free of charge. 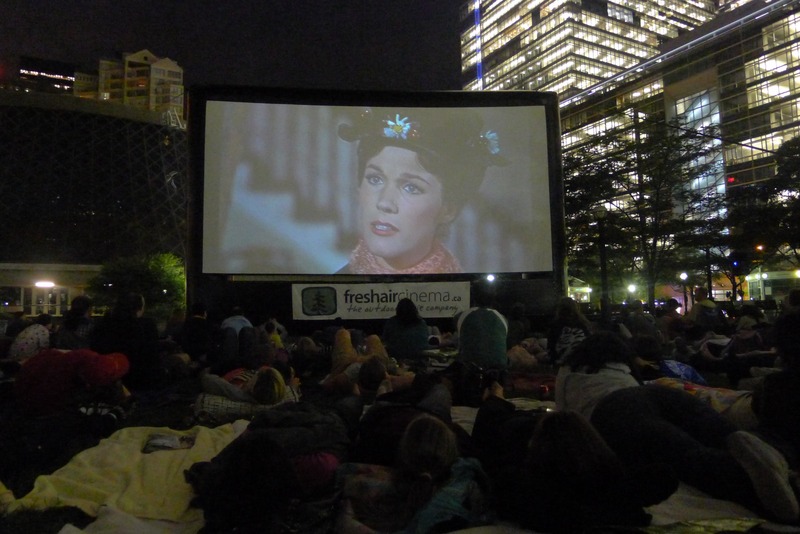 But what Innis saves me in funds, it lacks in ambience, and I find myself longing for the outdoor screenings that stretch across this city every summer (whoever created FreshAirCinema, the company that supplies massive inflatable screens, is a genius). Downsview, Christie Pits and Riverdale parks embrace the concept, as do Harbourfront Centre and Yonge-Dundas Square. One of the newest devotees, TIFF in the Park, is truly a marvellous thing. Heck, TIFF (Toronto International Film Festival) on its own makes Toronto an awesome place to live, as evidenced by how electric the city gets come early September. 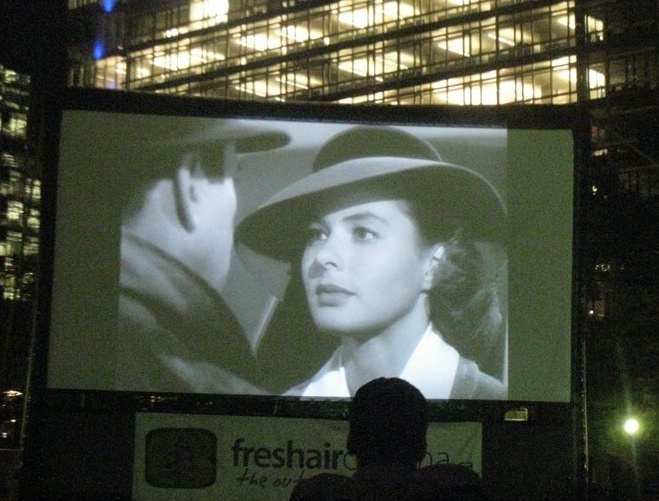 But since moving into the Entertainment District in 2010, TIFF has done its good deeds throughout summer, too, bringing us free movies outdoors every Wednesday night in David Pecaut Square, with the glow of the surrounding skyscrapers and the CN Tower creating a cool Technicolor backdrop (check out my fave TIFF in the Park pics below). No matter where you live, I implore you to watch as many films as you can en plein air! It really is refreshing to be outdoors, sitting or lying on the grass, having a picnic while escaping into the wonderful world of cinema. Ah, Mary Poppins! Another gorgeously saturated Technicolor musical under the stars, um, city lights. I liked how most of us were lazily lying on the grass but still singing along with much enthusiasm. “Is that cannon fire or is that my heart pounding?” Casablanca. Bergman and Bogie. Need I say more? A girl, her bike, a wee bit o' wanderlust...a lust for life in general. And all things pretty. We can't forget the pretty. happy new year to all, and to all a good (and safe) night! Enter your email address to follow lovingtheride.com and receive notifications of new posts by email. © 2011/2012 loving the ride. No part of this blog or its content may be reproduced without prior written permission.